The Il Rumoro Bianco project started in the year 2012 and the band released a 30 minutes debut EP “Mediocrazia” the following year. The starting point was progressive rock but the band implemented also influences of jazz, electronic, ambient and post-rock. All this together with a healthy portion of experimentation, the music of the band could be labeled as post-progressive rock. This second and full length album, “Antropocene”, is released on the Fading Records label and will be distributed worldwide by MaRaCash Records. You can find the following 8 tracks on “Antropocene”; “Al Crepuscolo Dell' Anima”, “Mediocrazia”, “Il Capitale Umano”, “Tempio Pallido”, “Tephlon (Club)”, “Il Giudice E Il Bugiardo”, “Antropocene Pt I” and “Antropocene Pt II”. The album opener is called “Al Crepuscolo Dell' Anima” and starts and ends with an up-tempo Rock based part with passionate sung vocals. The instrumental middle section is more jazz oriented and has a brooding atmosphere with an increasing intensity. “Mediocrazia” is more my cup of tea. You can find some great vocal melodies and nice jazz influenced instrumental parts in this track. A track of great diversity in which Alessandro Zara shows that he is a wonderful vocalist. The sax and the Rhodes piano in “Capitale Umano” and “Tephlon (Club)” brings us definitely in jazz fusion territory. But the band blends these influences with progressive rock so that I had to think of some early King Crimson albums which are also influenced by jazz music. “Tempi Pallido” has a beautiful piano opening with delicate sung vocals and develops into a nice Rock Progressivo Italiano (RPI) piece with some great synth melodies and vocal lines. With almost ten minutes “Il Giudice E Il Bugiardo” is the longest track of the album. The slow opening is attractive and the slow saxophone part reminds me somewhat of the Dutch band Solution. Later on the music becomes more intense and complex. It is a melting pot of musical styles and this song brings everything together, this is “Il Rumore Bianco”. 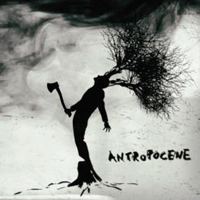 The album closes with the title track “Antropocene” which is divided into two parts. A short first part with acoustic guitar and delicate sung vocals and a much longer second part in which the tension of the music is slowly building up towards a climax. This is the progressive rock side of the band. Together with “Tempio Pallido” and “Il Giudice E Il Bugiardo” this title track “Antropocene” is one of my favorite tracks. The music of “Il Rumore Bianco” is a melting pot of musical styles. Besides the already mentioned jazz influences you can hear also some influences of electronic music in the keyboard experimentations. You have to listen to this album several times before it shows it's quality because the album has it's complexity. But on the other side the band came up with some very beautiful melodies in tracks like “Il Giude E Il Bugiardo” and “Tempio Pallido”. I enjoyed listening to this first full length album of Il Rumore Bianco and want to thank the band for providing the physical promo copy of the album for my review.